On the day of boarding, guests commence a check-out at their convenience (perhaps after taking breakfast at our water-side restaurant). The check-out will take around 2 hours and will include an inventory check, a thorough familiarization with all the yacht’s systems and a detailed navigation and chart briefing. 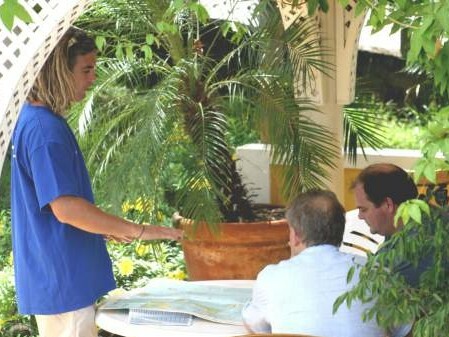 At Barefoot Yacht Charters, you can always expect personal attention during your stay and your chart briefing, is tailored exclusively for your holiday. Philip Barnard, Managing Director of Barefoot Yacht Charters and America’s Cup Sailor will provide you with your very own question and answer time. It is important to us that we share our local knowledge and ensure you feel relaxed and at ease on your sailing holiday. Your questions are warmly welcomed while we map out the perfect itinerary for your dream vacation.